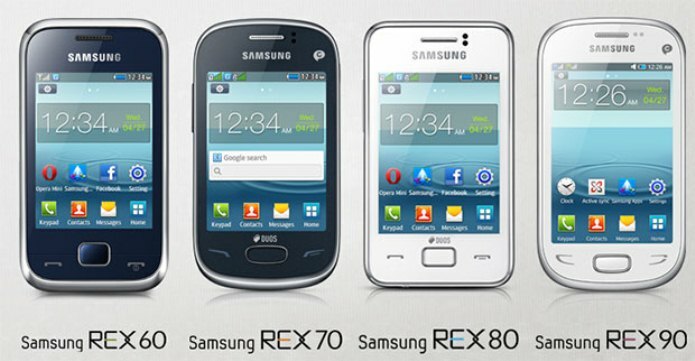 Samsung today release new REX series feature phones. The REX series has 4 models REX 60, REX 70, REX 80 and REX 90. The price range of the four new Samsung REX phones are from Rs 4,280 to Rs 6,490. The REX 60 features a 2.8-inch QVGA resistive display with resolution of 320×240 pixels, smart Dual-SIM feature, It has a 1.3-megapixel camera. Samsung claims 15 hours of talk time. It has Samsung’s TouchWiz UI and comes with Facebook and Twitter integration. The REX 70 sports 3-inch capacitive QVGA display with resolution of 320×240 pixels, smart Dual-SIM and a 2-megapixel camera, 13 hours of talktime. The rest of the features are the same as the REX 60. The REX 80 sports a 3-inch capacitive QVGA display with resolution of 320×240 pixels, smart Dual-SIM just like REX 7, it has 3-megapixel camera, Wi-Fi and 14.7 hours of talktime. The REX 90 has a 3.5-inch capacitive HVGA display with resolution of 480×320 pixels, smart Dual-SIM with true hot swap, Wi-Fi, 3.2-megapixel camera and 15 hours of talk time. Samsung’s REX series gets popular IM services like Gtalk, Yahoo Messenger and Push Mail with ActiveSync, Contact and Calendar Sync, Opera Mini web browser, Facebook Messenger, ChantOn messenger, Free games, music and app download from Samsung App store. The REX 60 is priced at Rs 4,280, the REX 70 costs Rs 4,570, the REX 80 is for Rs 5,270 and the REX 90 for Rs 6,490.